The NRL has declined to offer a career lifeline to under-fire cross-code star Israel Folau. 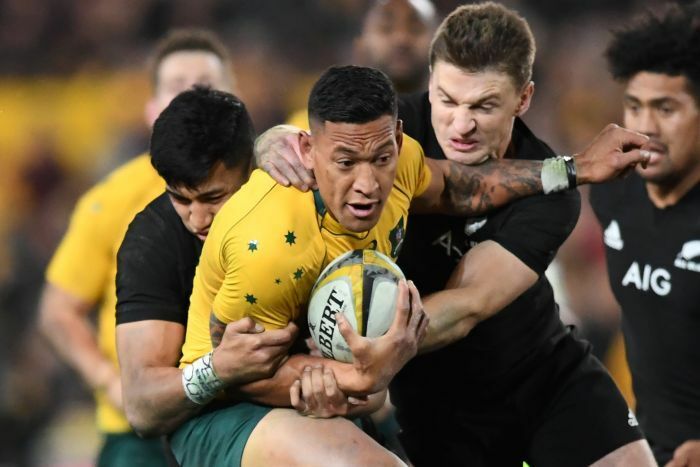 Folau is set to be sacked by the Australian Rugby Union after he doubled down on his comments that homosexuals were going to hell, in an Instagram post. But any hope of a return to the NRL, where he began his career, has evaporated after Australian Rugby League Commission (ALRC) boss Peter Beattie said the dual international failed the character test and they would not register a contract. “Israel Folau fails the NRL’s inclusiveness culture, which is a policy strongly supported by the ARLC,” Mr Beattie said in a statement. “The ARLC therefore would not support his registration to play NRL”. Folau played 91 matches for Melbourne and Brisbane, as well as eight State of Origins and eight Tests, before switching to the AFL and rugby union. It was touted that North Queensland could be interested in his services after Ben Barba received a life ban and they missed out on Valentine Holmes, who is in the US pursuing his NFL dream. But any hope of Folau returning to the game in which he made his name is now gone, and his future appears to lie in rugby union overseas. Under NRL chief Todd Greenberg, the game has been highly progressive, publicly supporting marriage equality. Mr Greenberg earned criticism from conservative commentators and politicians for hiring US rapper Macklemore to perform gay anthem Same Love at the 2017 grand final. Mr Greenberg had earlier declined to comment on Folau’s status — at least while Folau remained a contracted rugby player. However, when Folau posted controversial comments on social media last year, Mr Greenberg said he could be welcomed back to the sport, while also indicating that Folau’s use of social media to espouse his deeply held religious beliefs at the expense of others could be an issue. “All our athletes have to be careful,” Mr Greenberg told The Sydney Morning Herald last April.